LAPD Officer Paul Donath, 34, was killed when he and his partner responded to a call for help from a woman who was being shot at by her neighbor, who was upset about the sound of the woman's lawnmower. When Donath went to the front door of the house occupied by the neighbor, a 30-year-old woman with a history of mental illness, she fired one shot through the glass door, hitting Donath in the chest. Donath was born in 1898, the only child of James and Helen Donath, immigrants from Austria-Hungary. By 1910, the family was living in Gary, Ind., where James Donath was working as a carpenter. 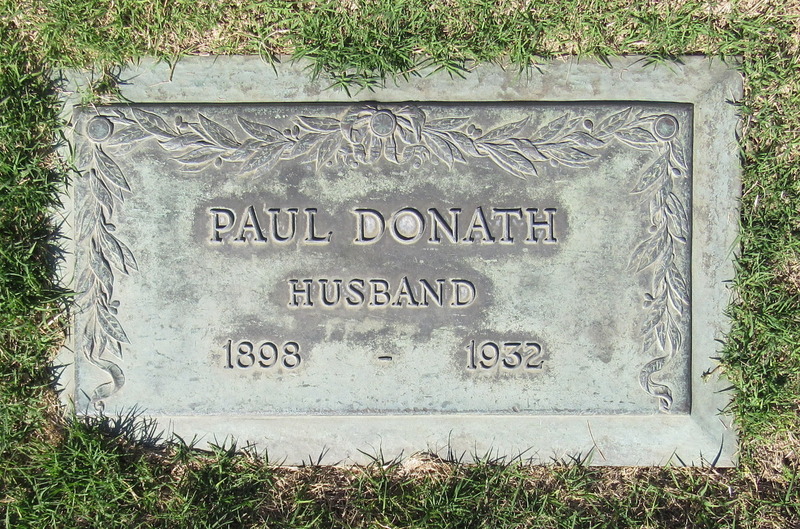 Paul Donath came to Los Angeles and joined the LAPD on June 21, 1922. The following summer, on Sept. 8, 1923, he married California native Virginia Hortense Sales in Santa Ana. The groom was 25, and the bride was 21. On Thursday, April 28, 1932, Pauline Pohl went outside in the early afternoon to mow the lawn at her house at 2647 Marsh St. At about 1:30 p.m., Pohl heard a shot from the house next door, and heard a bullet fly past her. She immediately ran into her house and called police. "The woman next door is trying to kill me," Pohl said. "Send somebody, quick!" Donath and his partner, Officer Percy D. Gunby, 37, were near the scene in their patrol car, so they went to the neighbor's house at 2645 Marsh St.
Donath went to the front door, while Gunby went around to the back of the house. When Donath rang the doorbell, the woman inside looked out through a window in the door, raised her pistol and fired one shot, hitting Donath in the chest and knocking him backwards off the porch. Hearing the shot, Gunby ran back to the front of the house and dragged Donath across the lawn, out of the range of fire. The woman fired a shot at Gunby as he ran to Pohl's house to call for an ambulance and additional officers, but she missed. About 50 officers arrived and surrounded the woman's house, urging her to throw the gun out and surrender, but she refused. Finally, officers tossed three tear gas canisters into the house. The woman ran to the back of the house, and started out the back door, where she was met by a wall of nearly 20 police officers pointing pistols and sawed-off shotguns at her. She paused briefly, then ran down the steps, firing three quick shots. None of the officers were hit, and they returned fire, killing her. Donath was survived by his wife, Virginia, who died in 1967, at the age of 64. Donath is buried at Forest Lawn Memorial-Park in Glendale. Donath's sign is located on the west side of the intersection of Marsh and Ripple streets, near the intersection of Interstate 5 and the Glendale Freeway (State Route 2). The house where the shooting took place was demolished for the construction of the freeway.